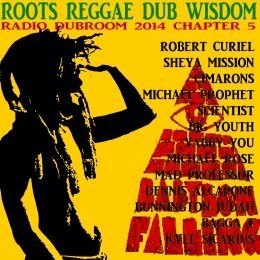 WWW, June 2014 - With Roots and Culture from all times and places, this chapter of Radio Dubroom shows how Reggae Music goes together hand in hand with consciousness. From Jah Wisdom to conscious observations, you will find it voiced over the bass and drum lines. Here is Roots Reggae Dub Wisdom: enjoy! The set opens up with a track from the download archives of yours truly: this one was available for download on the website from the (Netherlands based) producer Robert Curiel back in the previous century. It's a Dub full of vibes, just like the second one by Sheya Mission and the 1975 7" release by what many consider to be the first Roots Reggae band in the UK. Continueing with another rare vinyl single with Michael Prophet and a healthy portion of Dub re-released through the Blood and Fire label. Mchael Rose forms a bridge to more recent material, that is, from the last decade or so. Crucial material from Twilight Circus, Mad Professor, Slimmah Sound, Don Fe, and the new Dubroom release featuring Dennis Alcapone. Chapter five of Radio Dubroom 2014 is also the first mix done using the new hardware here in the Dubroom, a rather exciting thing to do but that's for another occasion.